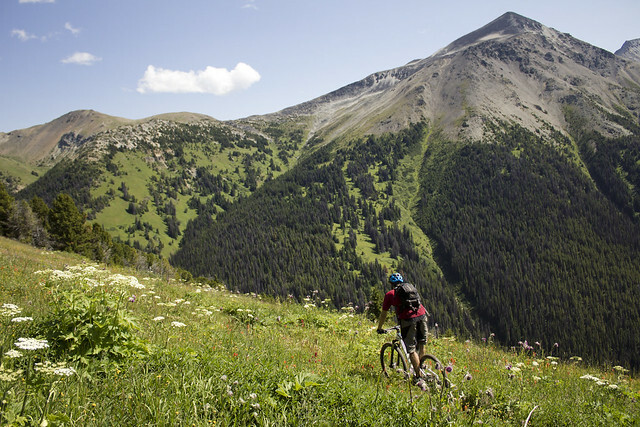 During the slow periods of the summer (between race meets and such), there is often an itch to get out and do something different on your bike—to break away from the average trail ride or park day. That period for me was just a few weeks ago. Towards the end of this slow period, right before the mayhem of Crankworx, a friend approached me seeking other like-minded, outgoing individuals to jump in on the hurt—I mean adventure—train and accompany him up to a remote range a few hours from of Whistler, B.C. As with many (male) organized events, details were slim and fairly last minute—only that we knew the days we would be gone, the general area we were to explore and that we were in for a massive adventure—PERFECT. Attempts were made to minimize the amount of vehicles that we took, though in the end there were to many coming and going at slightly differing times. As a result my mate Dave Reid and I packed the ‘Taco’ and headed up to Pemby alone, meeting up with his good bud, Ian Kruger. After a wicked smoothie and bite to eat at the Mount Currie Coffee Co. (must stop if in Pemberton) we headed out for a quick ‘warm up’ ride in Bralorne, en-route to our final destination. For those that have ridden around Bralorne, you know how good it can be, for those that have not… well, allow me to tease your imagination. We decided to hit an old classic that Dave absolutely loves, and perhaps for all the wrong reasons. You see, Dave is one hell of a trail builder and knows a thing or two about sustainable trail; however, he does love to rip some straight fall line single-track when the opportunity presents itself, and there was no time like the present. 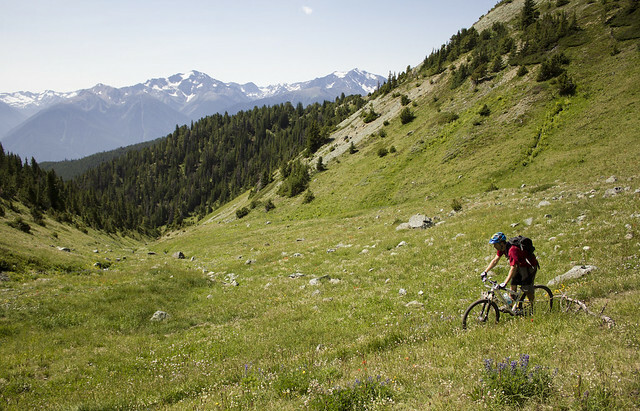 We drove way up an old FSR above Bralorne and dropped into some amazing old, though obviously rarely ridden trail that ducked and weaved through the rugged, dry vegetation synonymous with Pemberton, only in a location that sees likely a quarter of the traffic, if that! We took it fairly easy, as I led the way and had not ridden anything in the area before—that and I was also concerned about these “straight fall line, steep, surfer sections” that I had been subject to hearing about on the way up. Once a ways down trail the “surfer line” became quickly obvious. The trail took a slight left and simply dredged out! All that was visible was the thin sandy soiled line weaving through a younger section of pine forest. Once committed there was no turning back and stopping was out of the question! The focus quickly became the hard 90 degree left about 100 meters down trail, though you first had to tame the steep beast before it (the little punji stump about half way down did not help my case). We made it to the bottom of the section hooting and hollering, looking forward to more of the same. The trail continued along a little steeper than above the “surfer line” with a few more sections similar, only not quite as steep and with more rock and root, giving valuable texture to slow up a little on. We spat out on the road shortly after, surprised at how quick we lost all the elevation gained to get to the top, though stoked on the wicked old school, fall line riding we got along the way. We had only planned on the short lap for the day, given what we had in-store for the next and we also needed to drive another couple of hours before setting up camp for the night—preferably before dark. No ride in Bralorne was complete though without first stopping at the Mine Shaft Pub and taking in some of the local colour and culture (mostly of the scarlet variety…), regardless of how much light you need to pitch a tent. The beer was cold and the (safe) food orders we made were actually quite good! We hit the road soon after and met up with Hamish Fraser at our camp spot. Hamish is a nomad! A climbing pioneer in the Squamish area, who used to free climb the chief in hiking boots when younger. He since picked up mountain biking for something easy and enjoyable to access the outdoors with. His attitude, experience and sense of adventure were perfect to round out the team. He, along with Ian are also total map geeks—a definite must have on a trip like this. Introductions were made and fantastic stories were exchanged before calling it a night in anticipation of the day ahead. We all rose early on the Sunday morning, feverishly stuffing our faces with granola and yoghurt variations, and anything else that would fuel us for the travels ahead. By 830 am we were loaded up and out of camp, mobbing along old FSR’s, with very little to go on, in search of our drop off point. We eventually settled on a spot by a creek that turned out to be a couple of kilometres early, but it didn’t matter, we were all stoked to get kitted up and start pedaling our bikes. After 10 minutes we passed the area that we were supposed to park. This only made us more excited—we had officially found the first landmark of the day! Unfortunately not long after this we went up the wrong “steep, loose, old gravel road”, though lucky for us the climb only lasted 5 minutes before the mountain side let us know we were going the wrong way. Back down to the main FSR we went (with a flat tire in the mix), continuing along until the next road that met the description surfaced, and it was bloody obvious once it did! Before us was a 15 degree pitch, loose with dusty dirt and strewn with baby heads—but it only went a little ways before it turned to the left. Surely around that left it would mellow out!? It didn’t, and it remained of a similar pitch for 11km and 1,900m of elevation—good thing we started early! The road grew in and eventually spat us out into a beauty alpine bowl. At this point we took a much needed break, though not long, as we had only estimates of how long the day would be and were anticipating getting lost to some degree. After a short break we pushed our way up through the alpine bowl and onto a ridgeline, that from below honestly had me mentally preparing for some fairly serious rock scrambling. 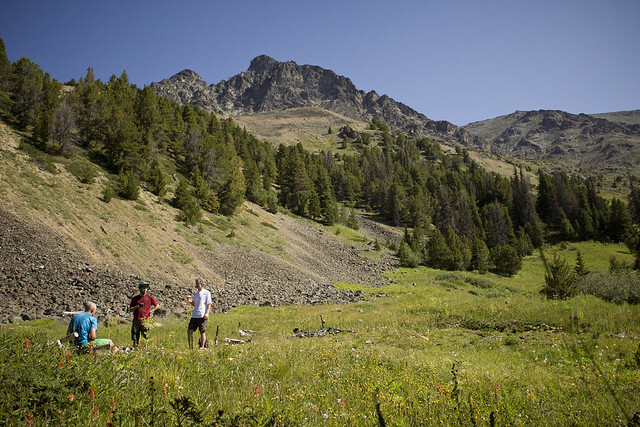 As luck would have it, we found a great little goat track up onto the ridgeline and was it ever worth it! Panoramic views of the surrounding coast mountains met our gazes. The stop was short lived, though we continued taking in what we could of the views as the group kept battling up the ridge. Not long after realizing we needed to get down from the ridge, did we notice a ‘trail’ below us, in the general direction that we were supposed to head. There was no trail from the ridge to that point though, so we kitted up and dropped in, getting all ‘Where the Trail Ends‘ freeride (hardly) and having a blast navigating the rugged alpine terrain. Once on the trail we began a large part of the rest of our day—crossing ridges, navigating drainages and mostly traversing to where we believed was our destination for the drop in point. We blasted through some spectacular alpine meadows, all the while surrounded by massive mountain peaks and generally overlooking a large valley on our right the entire time. After 6 hours of battle we were outdone by these same mountains—cornered with no-where to go—we had done it, we got ourselves completely lost. We knew that we needed to drop down toward the valley and it had hugged our right sides the majority of the day, though no-one could confidently say they had seen any such opportunity. So here we were, stuck in a boulder field that looked like something on the moon, high in the alpine, with no trail out other than the one we had used to arrive there. We swallowed our pride, turned around and rode back from where we came, keeping ourselves calm with the thought that, worst comes to worst, we could probably ride back all the way we had come—possibly before dark. Not forty minutes later the mountains opened up for us, presenting a turn that was somehow missed as we span along one of the few sections we were able to ride earlier in the day. 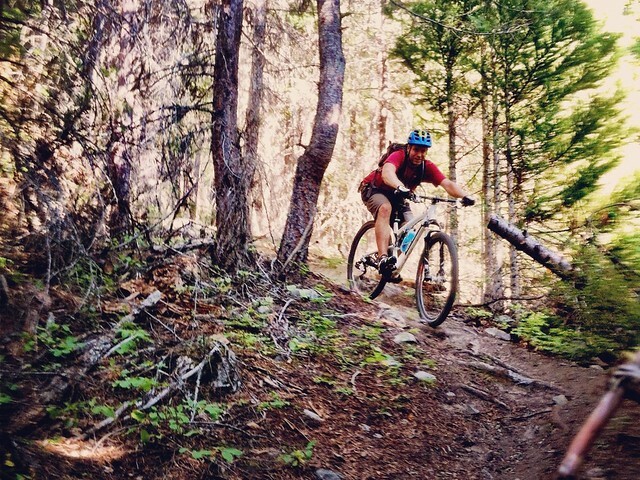 We were exhausted, mostly out of water and our hands had been cut up and battered by little alpine spruce trees, whose only joy is snipering you as you casually roll through tightly lined sections of trail—but it no longer mattered! We had found the decent, the ‘shang-ri-la’ we had come all this way for and aside from the adventure, the only reason we pushed up and across mountains for six hours! Everyone miraculously received their fourth wind for the day—both re-energized and excited for the potential that lay ahead of us. After six hours of fooling around in the alpine, we dropped in on one of the most enjoyable and amazing descents that I have ever ridden! It carried on—at speed—for roughly an hour, throwing all sorts of variations in terrain and vegetation at us along the way. We flowed, drifted and smiled the entire time! Corners came up quick, but ran so well, all that was required was some speed management and laying the bike over—look ahead, the next one is coming, but not before you pop off that lump, and throw a little carve off the side there! As we descended we could feel the heat of the day rise, we were well out of the alpine now and it only grew warmer as we motored down the mountain. The flow gave way to a terrifying, exposed and narrow traverse that had anyone have slipped up on, would surely see them slide a steep sandy slope into oblivion—but we kept it steady and moving. The final stage made us thankful for the warm up in Bralorne the day prior, for before we knew it, we were surfing incredibly steep, twisting, sandy terrain with little hope of slowing at any point. We screamed with joy, yelling back and forth at each other as we churned sand all the way to the bottom, where the trail abruptly ended, spitting us out on the FSR back to our trucks. Seven and a half hours later we were back where it had all started—stoked to be out with daylight and happy to have finally found the trail. We staggered around the trucks, not quite sure what to say other than “how good was that?” and “I thought we were spending the night for sure!” We were beat—both physically and mentally, but we each knew that was somewhat the point. Pushing boundaries on and off the bike, physically and mentally. At the end of the day it made the trail down that much better. It could have been a boring, low grade descent the entire way, but to us it may still have been awesome! Thankfully it was phenomenal, and not just because we were delirious. The memories and experiences gained from that ride will forever remind me why I love to spend as much time on my bike as I do. Thanks Greg! Unfortunately a map is out of the question for the same reason that any landmarks or trail names are. We were given the directions for the ride from a friend that had us promise to keep it under wraps. We are simply respecting his wishes. Maybe next time?